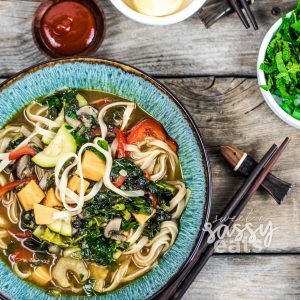 Are you looking for a soup that will ease your tummy troubles or chase that cold or flu away? 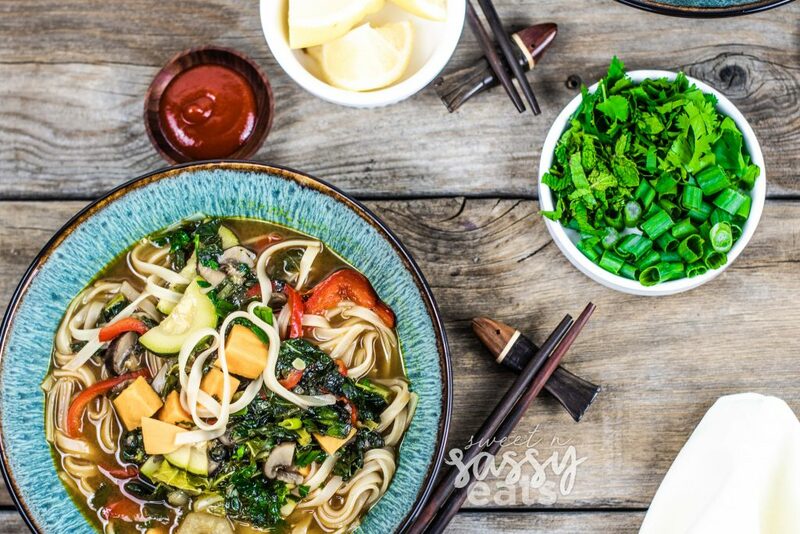 Do you just want a really tasty healthy soup? Well, I have the answer for you: this soup! What is so great is you can add or remove the veggies you want or to achieve the results you’d like. If you aren’t making this for kids or those sensitive to heat, go ahead and add Siracha (I just add it to each persons’ bowl individually so they can adjust to taste), but that stuff will chase congestion away in a second! You can even add more seasonings, like cinnamon and turmeric… they have awesome healing properties to them! Below I have put together some of the highlights of the benefits of each ingredient in this soup. 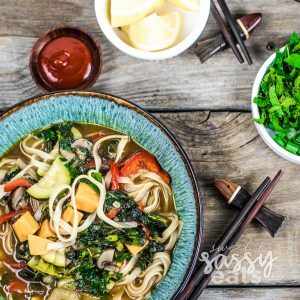 I didn’t mention the awesome benefits of the Bone Broth, because I dedicated a whole blog post to that! A Powerhouse Veggie! Loaded with the vitamins and minerals responsible for helping your immune system function, & shields you from free radicals! Enhances your immune system& loaded with antioxidants! Kale can legitimately be called a superfood, aids in DNA cell repair, while at the same time slowing the growth of cancer cells, can ease lung congestion, and is beneficial to your stomach, liver, and immune system. Low in saturated fat and cholesterol and high in fiber, Baby Bella’s are an excellent source of copper, which your body needs to produce red blood cells and carry oxygen through your body. Bell peppers are rich in vitamin C, they contain more than twice the vitamin C of an orange, helps protect against scurvy, & boosts the immune system. 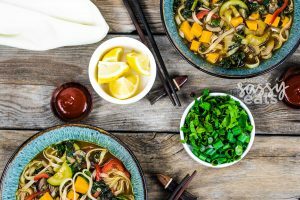 A good source of vitamin C, magnesium, potassium, copper, and manganese, ginger promotes the release of intestinal gas; it relaxes and soothes the intestinal tract. That means it can settle an upset stomach, relieve vomiting, and ease gas and diarrhea discomfort; but it’s also effective in preventing nausea in the first place. Can help with the symptoms of the common cold by acting as a natural decongestant. Helps with indigestion and gas due to its soothing properties. It also helps protect the lining in the stomach, which helps prevent gastric ulcers. The oil produced from star anise is used for treating cough and flu. Anise also helps improve digestion, alleviate cramps and reduce nausea. Consuming star anise tea after meals helps treat digestive ailments such as bloating, gas, indigestion, and constipation. 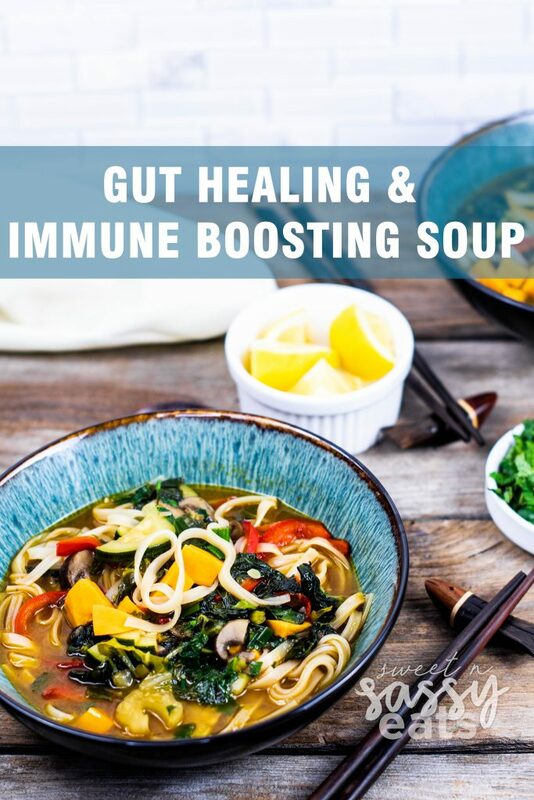 This soup is rich with all the good nutrients you need to heal your gut and fight off the cold or flu! The things you can do with this soup are LIMITLESS! Heat 1 tbsp Coconut Oil in a large pot over med-high heat. Add remaining veggies (including bok choy greens, but reserve 1/2 cilantro & mint for later) and stir. Add 8 cups of Bone Broth and bring to boil. (if you prefer your vegetable crisper, add the remaining veggies after noodles are cooked. Add rice noodles and cook until soft. (according to package instructions). Top with remaining cilantro and mint, and squeeze lemon juice. Stir & serve. Serve with Sriracha on the side! 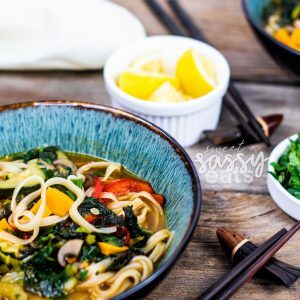 Previous Post: « Turkey Noodle Soup for the Soul!